Two in a row. And a third coming, too, because I’m headed to Toronto next weekend to celebrate Laurel’s 40th birthday in style. Whee! In the middle of Friday afternoon, the swing set we ordered at the beginning of June (and should have ordered about 4 years ago) arrived. 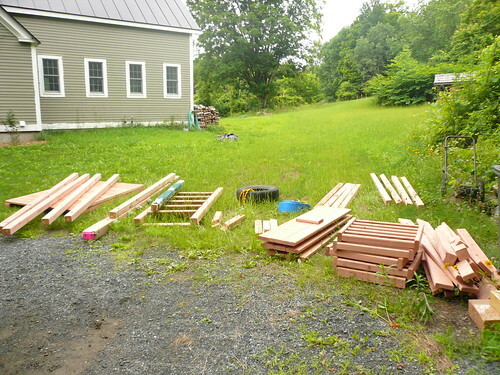 940 pounds of pre-cut and drilled redwood, with a box of bolts and hardware that alone must have weighed 30 pounds. Our neighbors ordered from the same company at the same time (they were the ones to point us to this company), so both arrived together and we helped each other unload. Friday afternoon was also the first session’s Parent Open House and show at Hyla’s camp, on the shore of Lake Fairlee. The campers are divided into groups by age and, after a point, by gender (this is the first year that Hyla’s in an all-girl group). 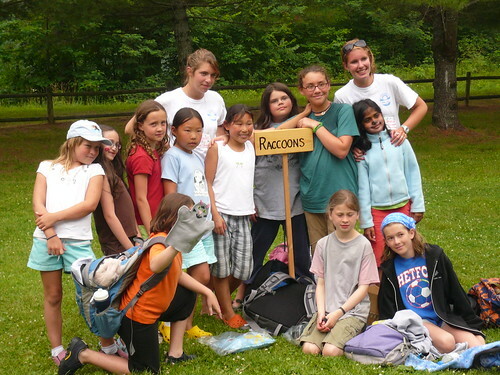 Each group has a animal identity (this year, Hyla’s a “Raccoon”) and a cabin where they can hang out at quiet time and discuss the pros and cons of “court sports”. At the end of every two-week session, families are invited to come to camp, get a tour, see the cabins, see a show (put on by some of the campers), and sing some camp songs. Hyla’s the one crouching in front, with a (cat) puppet in front of her face. After the tour and the cookies and the show (you can bet Hyla was a performer) and the singing, and a very moving slide show — how can you not get teary when you watch a five-minute slide show of your children and their friends having fun at camp, accompanied by some instrumental guitar music? 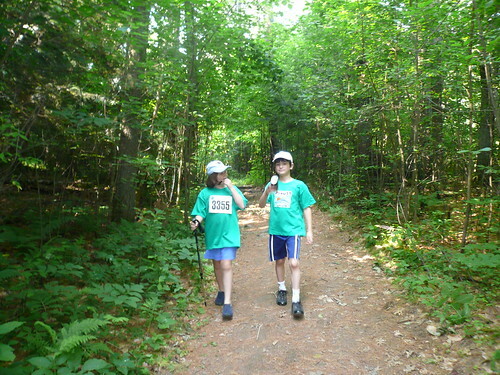 — we headed south, back to Hanover, to pick up our registration numbers and t-shirts for the Prouty walk. The best way I can describe the Prouty is that these folks really have their act together. They have over 700 volunteers working for the event, and, I believe, somewhere around 4,000 participants this year. They have generous sponsors who have donated everything from computers to food to paper goods to water bottles. Everything is choreographed. From a participant’s point-of-view, nothing is forgotten. You arrive the night before and are efficiently “processed”: given your bib numbers, your t-shirt and water bottle, any other prizes you’ve earned for reaching certain donor-level thresholds, and then you’re released out to the tents, where there is a virtually unlimited amount of pasta, bread, salad, drinks, and cookies. All free to participants. And all before the even has even begun. We went home, sated and tired and happy. But, in any case, we met up with friends and we were treated to an extensive, free breakfast buffet of bagels and yogurt and fruit and I-don’t-know-what-else because I was already full from the first three things. Next time, we need to do the 10k. There were people everywhere, with some 100-mile bike riders starting out at 5.30 or 6 am, other walkers starting throughout the morning, people coming and going, all ages, cancer survivors, families, community members. It was an astounding sight. And of course, when you reach the end and walk (or ride) under the balloon archway, there is, you guessed it, a feast — with music — and prizes — and face painting — and free massages — and golden coins showering from the sky. Ok, not that last one, but everything else is true. We went home, a bit tired, a little warm, and very happy. And then we sat on our porch and did very little for the rest of the afternoon. We had a friend/fellow walker with us (she’s an iron woman; she rode 25 miles on her bike and then walked with us! ), and Hyla’s friend, Wiatt. We drank cool drinks and watched the valley and enjoyed a summer afternoon with nowhere to be and nothing that had to be done. Except, oh yeah, that swing set is still in pieces, isn’t it? Who cares? We’re off to the annual Norwich Fair instead. A dinky little carnival on the Norwich green: fried dough and french fries, rides that will make you sick, games, and all your friends and neighbors out on maybe the most gorgeous evening of the summer so far. Hyla heaven. By 6, we were grilling burgers and Hyla had convinced us to have a picnic up in the swing set’s tower. By 7, I was completely out of energy. Deliciously so. Dog tired. Ready to do nothing. How can some weekends seem so short and useless, and others feel nearly endless and full of time for everything? Time is magical.